Lionsgate has released a trailer for The Letter, formerly titled The Stare. 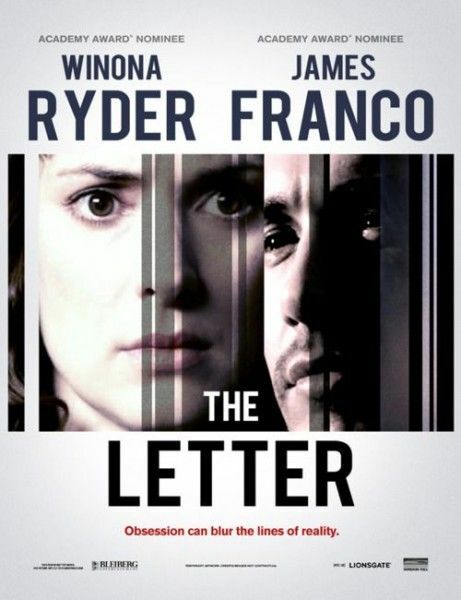 Winona Ryder stars as a playwright who starts to lose touch with reality: “She is plagued by dreams and visions of being watched, while also falling under the spell of her charismatic new leading man (James Franco).” Josh Hamilton, Marin Ireland, and Katherine Waterston co-star in the feature written and directed by Jay Anania (Shadows & Lies). There is no release date scheduled, but it looks like The Letter will premiere on VOD. The movie looks terrible in this clip, but I may be blinded by the ultra-low production values, so check out the trailer for yourself after the jump. A playwright (two-time Academy Award® nominee Winona Ryder, “Black Swan,” “The Age of Innocence”) begins to mentally unravel while preparing her latest work for the stage. She is plagued by dreams and visions of being watched, while also falling under the spell of her charismatic new leading man (played by Oscar® nominee James Franco, “127 Hours,” “Milk”). As the curtain call grows closer, she finds she can no longer decide if she is at the center of a manipulative plot or simply losing her grip on reality. Directed by Jay Anania (”Shadows & Lies”), the film also stars Josh Hamilton (“J. Edgar”), Marin Ireland (“28 Hotel Rooms”) and Katherine Waterston (“Being Flynn”).